Father Mike was telling me before mass how happy he was that on Trinity Sunday, it was the deacons who were scheduled to preach. To which I gave a half hearted “thank you”. Now, don’t get me wrong I love to preach God’s word to this community, the issue today is the topic. It's been said many times that there is more heresy preached on this Sunday of the liturgical calendar than in any other Sunday of the year. As fascinating as the dogma of the Most Blessed Trinity is, there is not much we can say without, falling short with the words we use. In fact I am of the personal opinion that the only thing I can say about the Blessed Trinity without risking being misunderstood is that the Trinity IS true; That the persons of the Father, the Son and the Holy Spirit IS the One and True and Only God. And as you can see only by using bad grammar I can be specific enough about this great mystery. Even our language falls apart when we use it to describe the mystery of the One God in three persons. Of course we do not need to understand the true nature of God to develop a relationship with “Him Who Is Love”. We can all experience this mysterious being, without getting a theology degree. The reason for this is because The Trinity is a mystery which wants to be explored, it wants to be part of our lives, it wants to have a deep relationship with us. The problem is that God is a pure spirit; we on the other hand are a strange mix of spirit and created matter. Our brains are not configured to understand spiritual realities and there is no higher spiritual reality than the One God. So we find ourselves in a dilemma, as material beings we are incapable to perceive and understand spiritual realities, but God is the highest, deepest, and most mysterious of all spiritual realities. Luckily God in his infinite mercy is constantly trying to get our attention, so he constantly enters into our daily lives and leaves markers, little signs of His love for us, which we would discover if only we were to pause every day and tried to find them. By discovering these little drops of God’s mercy, we can develop a deeper connection with this divine being. How can we do this? Well, in the two thousand years of history in our church many saints and spiritual masters have developed ways of discovering God’s mysterious actions in our lives. Today in this Trinity Sunday I would like to tell you about one method which is practiced every day by millions of people, and has proven to be very effective in discovering God’s mysterious actions. This method, developed by St Ignatius of Loyola is called The Exam and I call it the “5 Rs”: Request, Review, Relish, Repent, Resolve. 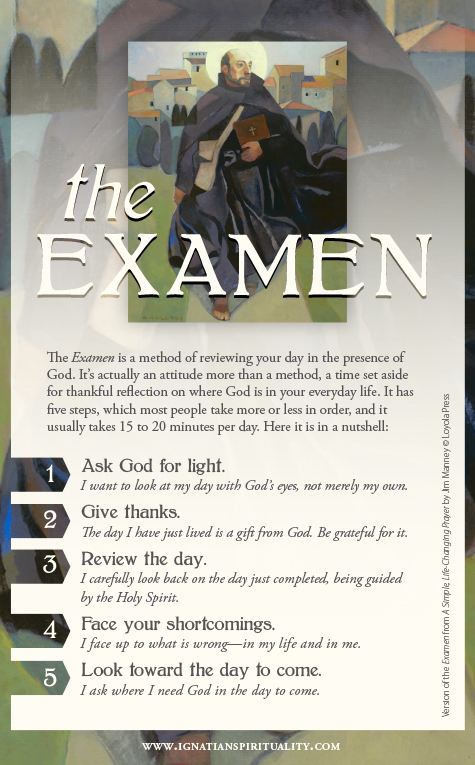 Request the Spirit to lead us through the exam. Begin with a short prayer to the Trinity, ask The Father, by the Son, through the Holy Spirit to help you on your examination of the day. Review the day. You can do this hour by hour or morning, midday, afternoon, evening, or home, commute, work, commute, home, there is not a set way to do this just do what comes naturally to you. Repent of any mistakes or failures. Don’t duel on these but don’t ignore them either. Again for each one of these as God for forgiveness. If any of these is serious enough, make a promise to yourself to attend the sacrament of reconciliation. Resolve, Ask God to show you how tomorrow might go. Imagine the things you will be doing, the people you will see, and the decisions you will be making. Ask for His help. My brothers and sisters although we will never understand the true nature of God, He is a loving father which is always looking for ways to let us know He is there. I encourage you in this day to make a firm commitment to discover all the little ways he uses to take care of you throughout your day. I promise you that if you do this you will grow in your relationship with God, who loves you and gave the live of His Son for you.